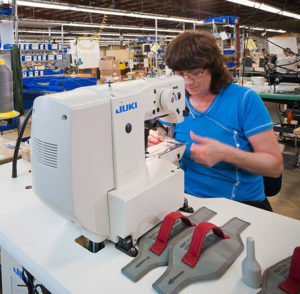 Mills Manufacturing is excited to offer commercial cut and sewing services for non-military clients. Mills Manufacturing began making cut and sew items, such as parachutes, tents, and mosquito netting, for the US Armed Forces during WWII. Soon after, the manufacturing of military parachutes and related components became our focus. Looking back over the years, you could say that the transformation of raw materials into lifesaving devices has become our specialty. Commercial and industrial businesses that design textile products often rely on sewing contractors to bring their plans to fruition. When seeking out a trusted manufacturer, they often look at their reputation and capabilities. 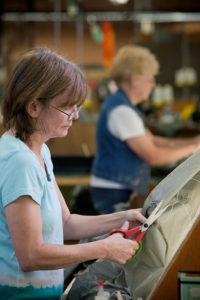 With our proven track record in parachute manufacturing, Mills Manufacturing has just the right conditions in place to make highly engineered sewn items of other varieties. We’ve recently expanded our already successful textile manufacturing services to include contract cut and sew manufacturing for non-military clientele. Our hope is to fulfill the needs of established companies looking for custom, high-quality, American made products. With our expertise, tested processes, and safety checks in place, we have everything needed to manufacture highly engineered products for a range of industries and markets. And it’s all under one roof! Since we manufacture all military items in accordance with strict US Government specifications, we’re well accustomed to paying close attention to details. As items move from step to step, every safety measure is taken to ensure that they will meet or exceed standards. Contract cut and sew items for commercial and industrial business will be held to the same level of testing and inspection as our products for the military. Every item delivered to our customers is of military-grade quality and was made to last. To ensure the consistency, durability, and effectiveness of our manufactured goods, we invest in our people and processes and believe continuous improvement contributes to our success. View our full list of capabilities and process. While we’ve updated our technology to match the latest innovations, we continue to have a hands-on team of assemblers, operators, and inspectors. Many individuals on our staff have decades of experience at Mills Manufacturing. We’re happy to lend our expertise to help you make informed decisions. We work with a range of textile materials and understand how they move and perform. Learn more about our materials.